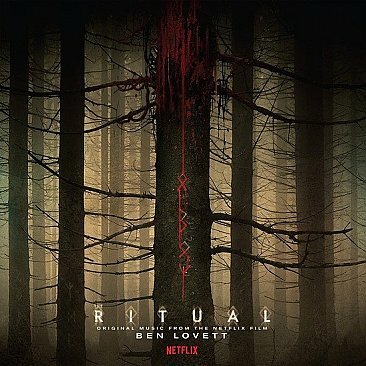 Death Waltz, in association with Lakeshore Records & Netflix, is proud to bring you the score to The Ritual. The Ritual is part of the new wave of folk horror films (The VVitch, into darkness as four friends travel to Sweden to go camping and pay tribute to a fallen friend.As they get deeper into the woods they discover strange symbols etched into trees, a gutted Elk and an empty cabin filled with Ritualistic artifacts. Someone (or something) is in the woods watching over their every move and a quiet creeping dread begins to descend on the party eventually giving way to an all out attack on the sense as the film races toward its inevitable climax. Ben Lovett’s score (featuring woodwind, strings and the occasional synth) captures the mood of the forest perfectly, It is both tribal and haunting. The score runs a range of emotions; One minute it is reflective and relaxed the next sinister and terrifying. Absolutely essential stuff from one of the most exciting composer working today.